It is one of the most common stories of mankind, to be repeated time and again: a few greedy individuals make profit at the expense of the populace. Take the financial scandal on Wall Street, speculators and the price of oil at the exchange market, or, in this case, climate change antagonists. Who exactly benefits from polluting the atmosphere? The environment? People? No. It’s the utility companies, their stakeholders and their paid spokespersons. Unfortunately, the general public cannot discern between what are scientific facts and what are downright lies. But thanks to Kristin Shrader-Frechette, Professor at the Department of Biological Sciences and Department of Philosophy at the University of Notre Dame we now learn why some deny that global warming is happening. We learn what is really at stake when we build new nuclear power plants. We learn that nuclear fission is not the answer to climate change, contrary to what many leaders, including the Obama administration, tell the public. With three post-docs in her pockets, biology, economics and hydrogeology, Shrader- Frechette takes the reader through the common pro-nuclear arguments and refutes them by relying on scientific evidence, logic and behind-the-scene investigations. Her powerful arguments are well thought through and quite easy to understand. One danger of reading the book is that it can infuriate the reader. As she demystifies the entire nuclear energy agenda, taking the reader through its scientific, medical, economic and ethical applications, the author reveals what must be today’s biggest scandal. Just consider some of her arguments. 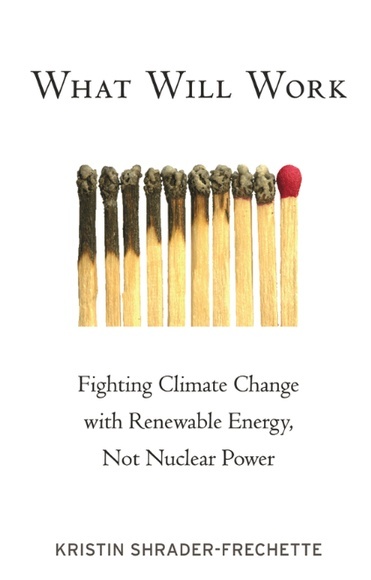 Reducing the carbon footprint by way of nuclear fission makes no sense because when one counts all 14 cycles of a nuclear power plant, it is evident that its creation, maintenance and dismantling require more energy than the nuclear reactor will generate in its lifetime. Furthermore, civil nuclear proliferation increases the chances of terrorist attack: it requires very little plutonium to make weapons, and already nuclear storage sites worldwide cannot explain how some plutonium has gone missing from their stocks. Or, those who live close to a “normally” functioning nuclear reactor are more at risk of cancer, especially children, who are 38 times as vulnerable to radioactivity as adults. Clearly, nuclear power plants are neither efficient nor safe. Yet last month the Obama administration authorized the creation of two nuclear power plants, costing the taxpayers $14 billion. But why do leaders pursue nuclear power as an answer to the energy crisis and energy security despite all the factors against it? Desperate as the situation might seem, the book offers compelling answers and solutions to one of our generation’s most pressing issues. Shrader- Frechette’s fiery tone is invigorating, and one can only wish for today’s leaders to be as conscientious, courageous and honest as she is.